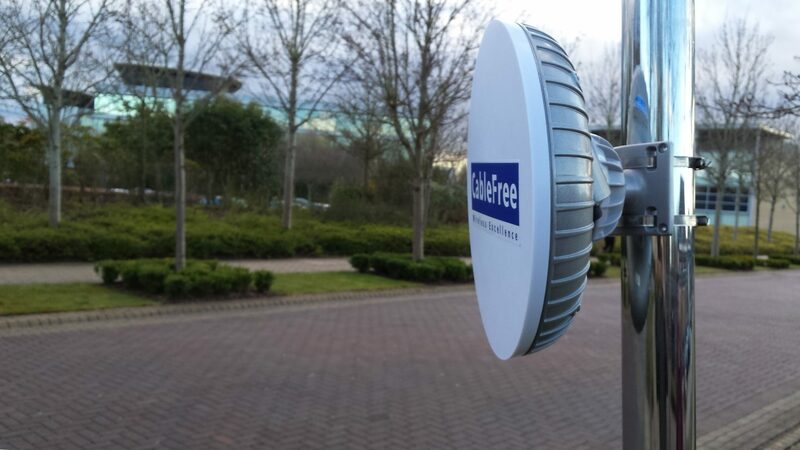 CableFree UNITY is an industry-leading Multi-Gigabit, Carrier-Grade, Long Distance alternative to Fibre Optic Networks. A UNITY solution achieves weather independence by using complementary technologies over the transmission path, where effects such as tropical rain, snow, fog and dust storms are overcome by ensuring that sufficient active live paths are available. Current existing links using a single traditional wireless technology have inherent weaknesses based on the electromagnetic spectrum wavelength that it uses – for example light-based FSO is negatively impacted by fog, while radio-based Millimeter Wave frequencies are susceptible to rain fade. Combining diverse, complementary technologies allows CableFree to overcome this using Wide Wavelength Diversity (WWD) and ensure that the combined link achieves uptime of 100% or as close as physically possible. The combined link technologies gives increased capacity. For example, adding 1Gbps MMW and 1Gbps FSO gives 2Gbps. Each path may have 99.99% uptime – which means 2Gbps during 99.99% of the time, dropping to 1Gbps for the few minutes per year. Using diverse wireless media with complimentary fade mechanisms: for example MMW fades in rain but not fog, FSO fades in fog but not rain. The two never occur together. Radio links are unaffected by rain. A composite UNITY link can offer the longest range compared to any one technology alone. Using diverse media ensures highest possible availability. No one failure mechanism exists with UNITY: Each path may have for example 99.99% uptime – but with complimentary fade mechanisms, the composite link will attain far higher availability as one link path will always be “up” even if the other experiences a few seconds or minutes outage. Software Defined Networking (SDN) in CableFree UNITY is used to ensure that the user network traffic is prioritised over the available airside bandwidth in a highly customisable, intelligent manner and ensures simplicity, flexibility, transparency and great control of user traffic and experience. CableFree UNITY offers huge advantage over attempts by vendors to make “one box” solutions: if any element of the solution requires replacement, upgrade, then it can be exchanged or added without affecting customer network service over the existing UNITY elements. For More Information on CableFree wireless solutions, please Contact Us and our team will be delighted to advise on a precise solution to match your exact requirements.